Sean Spicer's new book details his time with Trump's campaign and presidency, in an attempt to set the "record straight." In "The Briefing: Politics, the Press and the President," the former White House press secretary repeatedly praises Trump and calls him a "unicorn, riding a unicorn over the rainbow." He admits that Paul Manafort was key to the Trump campaign, refuting his previous claims that Manafort played a "limited" role. Spicer also claims that his handling of the debate over Trump's inauguration crowd size was the "the beginning of the end" of his time as press secretary. Sean Spicer has written a book detailing his time working for Donald Trump, and described the president as "a unicorn, riding a unicorn over a rainbow." "I don’t think we will ever again see a candidate like Donald Trump. His high-wire act is one that few could ever follow. He is a unicorn, riding a unicorn over a rainbow. "His verbal bluntness involves risks that few candidates would dare take. His ability to pivot from a seemingly career-ending moment to a furious assault on his opponents is a talent few politicians can muster." The Guardian obtained a copy of the book, which will be released on July 24. It is Spicer's attempt at "setting the record straight," according to the book's description. Spicer resigned last July after six months on the job, but has remained a vocal fan of Trump. Spicer's role started off to a rocky start when, two days after Trump's inauguration, when he declared Trump had "the largest audience to witness an inauguration, period." 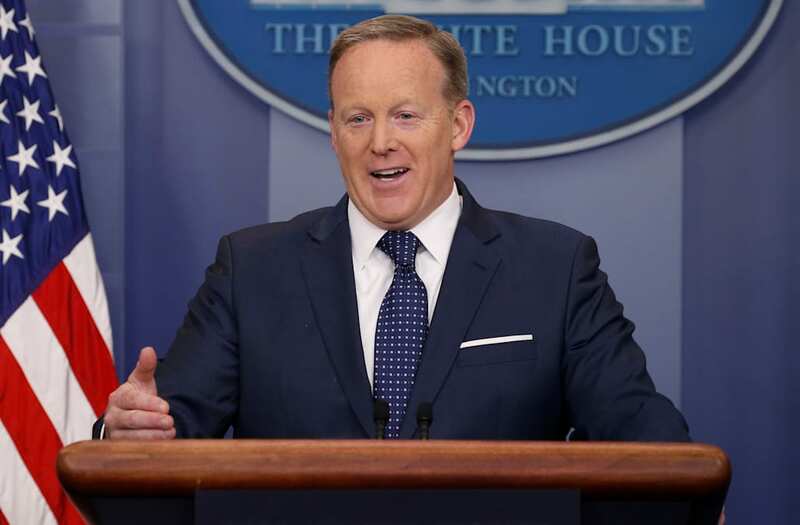 Despite photos of the event showing a crowd much sparser than former President Barack Obama's 2009 inauguration, Spicer insisted that no other president attracted a bigger crowd of visitors and fought with reporters who challenged his assertion. Spicer repeatedly went back and forth on whether Trump's decision to block people from seven Muslim-majority countries from entering the US was indeed "a ban." Even though Trump himself tweeted about the travel ban, Spicer insisted that it "can't be a ban" and should instead be called "extreme vetting." During his time as press secretary, Spicer became known for repeatedly sparring with reporters — such as when he told one journalist to "calm down" and another one to stop shaking her head. "Calm down," Spicer once told a journalist who was asking him questions about Trump's claims of wiretapping during the 2016 elections. There was also the time when Spicer said that Americans could definitely trust Trump — "if he's not joking." "If he's not joking, of course," Spicer once told a reporter who asked if Americans could trust the things that Trump said. He followed that by saying that Trump was still correct when he said that 3 million Americans voted illegally in the 2016 election. Even though Paul Manafort served as Trump's campaign chairman for three months, Spicer once told reporters that he played a "very limited role" in the campaign. During a press briefing, Spicer said that Manafort — who spent three months as Trump's campaign chairman — did not play a large role in Trump's administration. That came in response to questions about the investigation into alleged links between Russian officials and the Trump administration. Hitler did not resort to "using the gas on his own people," Spicer once falsely said to a room full of reporters. One of Spicer's biggest controversies came when he falsely stated that, unlike Syrian President Bashar al-Assad, Hitler had never used chemical weapons and did not resort to using gas "on his own people." Spicer later apologized for both of these comments, after numerous Jewish groups and students of history called for his resignation. "If the president puts Russian salad dressing on his salad tonight, somehow that's a Russian connection," Spicer once said to questions about Trump. In late March, Spicer tried to downplay questions about whether Trump had collaborated with Russian officials by saying that the media used anything as nebulous as Russian salad dressing to demonstrate a connection. Another notorious moment occurred when Spicer ducked into some bushes to avoid reporters' questions on Trump's abrupt firing of FBI Director James Comey. Back in May, Spicer struggled to avoid the media firestorm that arose after Trump unexpectedly fired Comey — by momentarily ducking behind some bushes by the White Hose. The move only exacerbated the public's frustration and prompted quite a few "Spicer in the bushes" memes. In the book, Spicer also admitted that Paul Manafort, who is the focus of Robert Mueller's investigation into the Trump campaign's ties to Russia, played a central role in the Trump campaign — refuting his previous claims that Manafort only had a "limited role" for a "limited time" in the campaign. "Paul brought a much-needed maturity to the Trump campaign when it needed an experienced political professional operative more than anything else. "There was no semblance of a campaign structure, just a few, distraught, overworked people constantly barking into their phones. Paul immediately set up and staffed the political and communications operations necessary to take on the Clinton machine. "The Manafort message was clear: Trump will be our nominee and our next president, and anyone who didn't want to work to that end could spend the next four years in political Siberia. (No Russia pun intended.)" In the book, Spicer also claimed that Trump was unhappy with the way he handled the debate over the inauguration crowd size with reporters — which marked "the beginning of the end" of his role as press secretary. "This was the largest audience to ever witness an inauguration, period, both in-person and around the globe," the then-press secretary claimed last January, contrary to the numerous photos taken of the National Mall on Friday that appeared to show a smaller audience than the crowd at former President Barack Obama’s 2009 inauguration. Spicer assumed Trump wanted him to be "strong, aggressive, no questions," he said in the book. Instead, Trump was angry that he did not take questions and that Spicer did not run his statement by him. "I had made a bad first impression, and looking back, that was the beginning of the end." Spicer has sought to remain in the spotlight after his departure from the White House. He is planning to host a TV show that would have him talk to interesting guests, and he also recently started a podcast with the Fox News contributor Katie Pavlich.